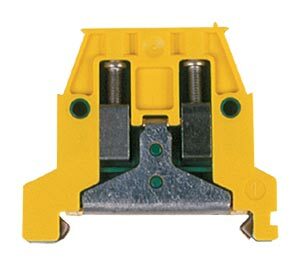 Ground terminal blocks mechanically and electrically connect wires to the DIN rail by using a metal clamping bar. In this way, the DIN rail can function as a ground bus bar. By international standards, ground blocks are color-coded as green and yellow. The Size You Need OMTBV7-W feed-through terminals come in ten sizes and are rated to 600V (800V IEC). They accommodate a full range of wire sizes from 30AWG to 3/0 AWG (0.5mm² to 70mm² wire cross section). Many "specialty" feed-through terminals are also available that provide multiple terminations or increase the density of connections. This reduces panel space and saves money.